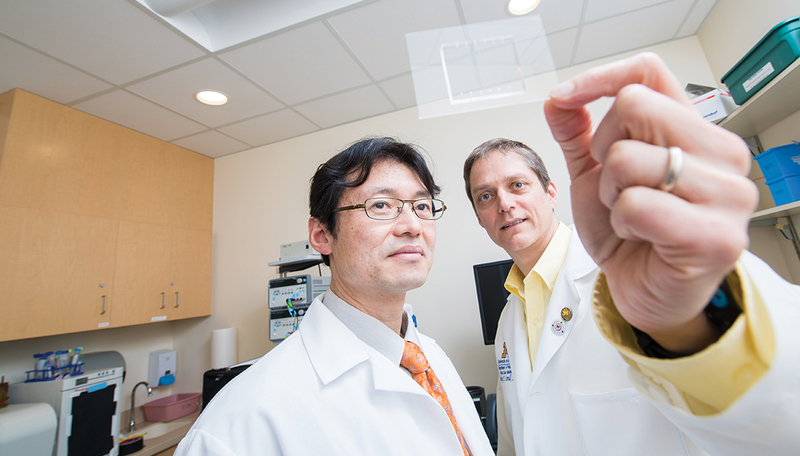 A multidisciplinary University of Michigan team has developed a device to quickly assess the immune response in pediatric patients admitted to the intensive care unit. In most cases of injury or illness, the body will initiate the normal inflammatory immune response that allows the immune system to fight infectious agents and powers the body to start repairing damaged tissues. In up to 80 percent of patients admitted to a pediatric intensive care unit, that response becomes dysregulated, the effects of which can be quick and dangerous. “It’s important for us to know how a child’s immune system is behaving in a situation like this,” says Timothy Cornell, M.D. (Fellowship 2007), an associate professor of pediatrics and pediatric critical care medicine at U-M’s C.S. Mott Children’s Hospital and a member of the team that developed the device. The current standard is a test measuring inflammatory proteins in the blood that can take hours to days, depending on a hospital’s resources. Further, the tests require 2 to 5 milliliters, or about one teaspoon of blood. Drawing that amount of blood routinely from a sick child can be a challenge, the team says. Cornell and his U-M colleagues, including College of Engineering faculty members Jianping Fu, Ph.D., and Katsuo Kurabayashi, Ph.D., wanted a better solution. The group’s microfluidic device uses a miniscule amount of blood — 5 microliters — to provide test results in 30 minutes. Although the new device is still in the research phase, the FDA’s Compassionate Use program allowed its use in a recent pediatric cancer patient case. An oncologist was able to use information provided by the test to support adjustments to a patient’s treatment and immune therapy. The patient’s condition rapidly improved because of the therapy, and she was eventually discharged home. The technology brings immune response management into a new era of precision medicine, allowing doctors to treat a patient based on his or her individual situation versus applying a standard protocol universally. This test will help us see who’s at higher risk for … sepsis and which patients may need more aggressive inflammatory modulating therapies. —Timothy Cornell, M.D. Cornell and his colleagues have received funding from the Wallace H. Coulter Foundation and the Michigan Translational Research and Commercialization program to develop the processes needed to move the device from the research lab into clinical trials. They have formed a company around the new device, PreDxion Bio, to build sustainable manufacturing processes that will further expand the application of the device. Their business focus is on creating relationships with manufacturers that can help them scale production up from four to 400 devices a day.